You may register for Workshops online with the button below. Once you submit the form, you will receive a confirmation to print and mail with your check. Your registration will be complete and your spot reserved once we receive your check. If you’d rather, you may print the pdf registration form, fill it out and mail your check with that. Register early to save your spot! 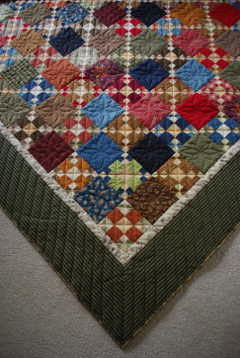 Quilters of the feed sack era embraced string piecing as a way to use up every last fabric scrap. But it also offers countless design opportunities, which we’ll explore. Then you’ll use your own scraps to create quilt blocks on a paper foundation. 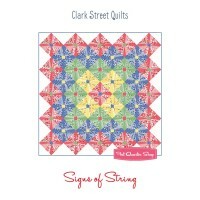 You can string-piece “free-form” or use the pattern “Signs of String” by Clark Street Quilts They use slightly different techniques and we’ll learn both. This class will get you over your fear of triangles. 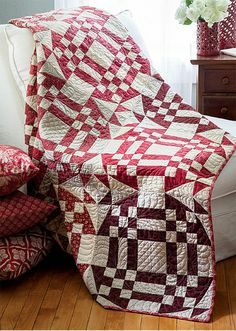 Using the 8-at-a-time triangle squares method you’ll be able to piece this quilt much quicker than you ever thought you could. 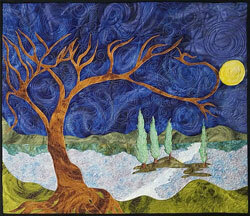 The choice of fabric is what makes the lines in this quilt blur and help create movement in the design. 75″ x 87″ finished. Using fat quarters of red and tan (or contemporary colors), weave a spider’s web that’s not to be denied. The blocks in this quilt have many names such as “Young Gentleman’s Fancy” and “Spiders Den.” We’ve chosen Spider’s Den as our inspiration and titled this quilt “Will You Walk Into My Parlor” after the famous poem by Mary Howitt. This is an intermediate class that will delve into making strip sets and working with elongated triangles/rectangles. A handy tool, cutting diagrams, and strip-pieced nine patches make sure you don’t get stuck. Requires some fabric cutting prior to workshop. Instructions will be emailed to participants. Curvy Improv is a pattern that brings together my love of free-form curved piecing techniques and raw edge applique. My liberating approach takes all the traditional rules for perfect cutting and piecing and tosses them right out the window making this a fun and worry-free project for quilters of all levels. What do you get when you combine any three colors? An explosion of color theory! Explore some of the ideas behind color theory while creating a mini version of the Moon Dance pattern from Sew Kind of Wonderful. Challenge: Select two fabrics and colors you love and make your quilt timeless with a two-color layout! Choose solids to give it heirloom beauty. 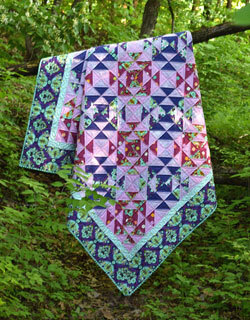 Sedona is a beautiful quilt that has a variety of blocks with both straight and curved piecing. The QCR Mini Ruler makes cutting and sewing curves fast, easy and fun! Choose 1, 2, 3, or all 11 blocks to create the beginnings of a quilt which will be timeless and unique. Quick cutting and piecing techniques will be taught and demonstrated to make your original design fast, fun and finished! 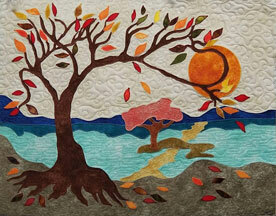 This class explores curved piecing without pins or finding the ‘center.’ Open to all skill levels. Start this asymmetrical quilt in July so that you’ll have one ready to go for the holidays–or several if you become addicted to the pattern and exploring how to change it up like I did. “Bright Christmas” is a free pattern, available from Hoffman California Fabrics, that uses two sizes of equilateral triangles to create a simple yet stunning design. In the workshop, I’ll show you how I’ve adapted the sizes of the triangles to change the quilt from the original lap size (54″ x 66″) to wall-hanging and tiny quilt sizes. In addition to size variations, you’ll discover color and triangle placement options to add depth and originality to the pattern. 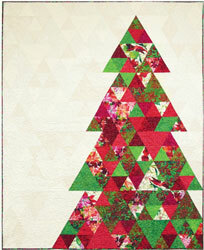 This is a perfect Christmas fabric stashbuster quilt. The more variety, the better. Brush-up on your quilting skills with a master quilter. Introduce a friend to the joys of quilting! Learn and practice in a relaxed, congenial setting. Topics covered will include strip sets, rotary cutting, hand quilting, fundamentals of piecing, and a variety of other skills that contribute to a satisfying quilting experience. The lacy elegance of paper snowflakes is translated into fabric in this applique technique indigenous to the Hawaiian Islands. 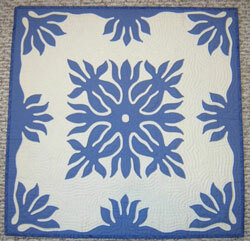 Surround a 12” central motif with an elegant appliqued border. The resulting 24” piece is stunning by itself, or spectacular as the central medallion for your next quilt. 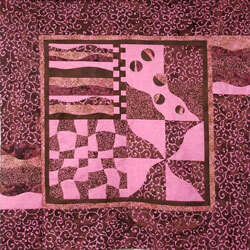 Students will learn how to design a motif, apply it to the background, and applique with invisible stitchery. This is a handwork class; no sewing machine required. This class is limited to 16 students. One of the things I love about doing scrap quilts is that I learn something new about fabric combinations with each quilt I do. The construction technique for this quilt contain a bit of magic! Using four patch blocks in the construction of this nine patch variation will really allow you to fine-tune your piecing and fabric selection skills. This class is limited to 16 students. All meetings and workshops will be held at the West Des Moines Christian Church at 4501 Mills Civic Parkway in West Des Moines. To get there from Interstate 35, exit at Mills Civic Parkway, exit 70. Turn east onto Mills Civic Parkway and drive about 0.9 mile. The West Des Moines Christian Church will be on the north side of Mills Civic Parkway. Meetings are in the Sanctuary in Building 2 and workshops are in Building 3 (Closest to PrairieLife). Registrations paid for at the time of registration are placed on the paid/confirmed list. Registrations not accompanied by payment are not confirmed and are put on a waiting list, subject to available space at time of payment. Once payment is received, if space is still available, class registration is confirmed. No one will be considered registered for a class until payment is received. Once a class is full, those on the waiting list need not make payment until space becomes available. 30 days prior to a class, any vacancies become available to non-guild members at an additional fee of $10 per full-day class or $5 per half-day class. Payment is refundable if cancelled at least 30 days prior to the day of the workshop. One check may be made out to DMAQG for all workshops chosen. *Some classes have additional fees, payable to the instructor, on the day of class. All classes will be held at the West Des Moines Christian Church, Building #3, 4501 Mills Civic Parkway, West Des Moines.